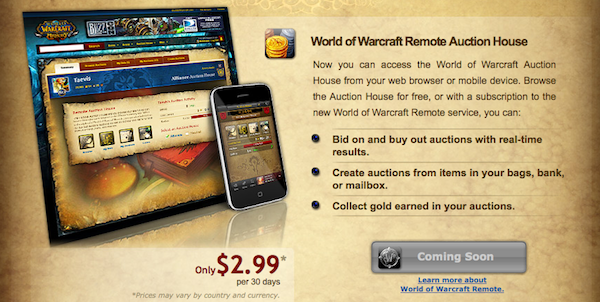 Blizzard, developer of World of WarCraft, has just announced the beta for their new Remote Auction House feature that allows WoW players to utilize the in-game auction house via a web browser or WoW Armory iPhone app. The service is currently only available to select realms with all realms eventually being able to gain access in the near future. Access to the Remote Auction House service will run you $2.99 per month when it is finally launched publicly. This is of course in addition to the monthly fees already charged for your in-game World of WarCraft account. Currently the beta is restricting players to 25 transactions per day, per account. However, this restriction will be lifted for the official release. You can learn more about the Remote Auction House here and check out a full list of realms eligible to participate in the beta below. Next Entry: Android Powered Google TV is Here!